Land line phones are a funny bunch. They hardly get used in the home environment, and even work places are ditching them and replacing them with IP enabled phones or just mobile phones. The fall isn’t just because of the lack in popularity of land lines. In fact, land lines are still way more reliable than mobile phones, and nobody doubts that. So why do we not talk about land line phones like we do about the latest iPhone ? Simple. Land line phones have always been a bit dull, and basic. They have offered you all you need, but nothing more. Smart phones on the other hand, have tried to give you extra, and made you think you need extra. 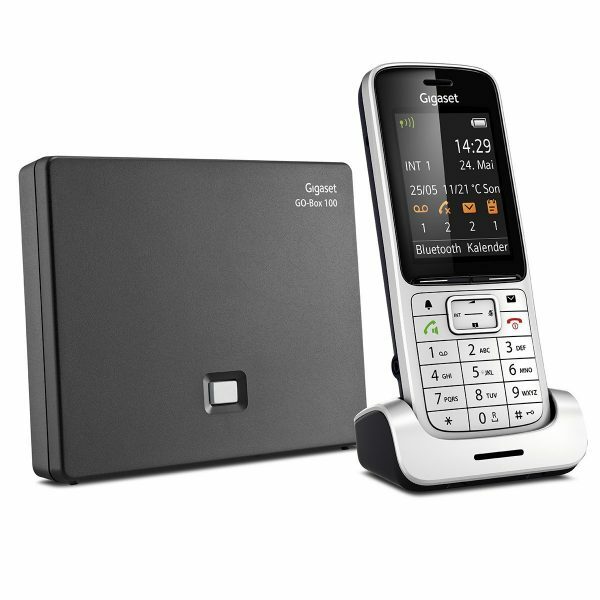 Gigaset are catching up with their latest phone, the SL450A Go. It looks the part, and it gives you the functionality too. It is packed in an aluminium frame, and features a 2.4 inch TFT colour display. Good enough to actually display a picture of who is calling! A good fit means it fits well in your hand, and can be used easily to make long phone calls. Keypad is lit too, just in case you were wondering. In terms of making phone calls, the sound quality is pretty good, and the best part is that this comes with nuisance call blocking technology. The idea is simple. You enable CLI, and using different options, you can accept calls from only your contacts and blocking all unknown numbers to accepting everyone, and blocking numbers afterwards. Of course, you will need CLI enabled from your service provider to use this service. And if address book is an issue, this actually does allow you to sync your contacts via Bluetooth, or through PC using Outlook. The address book is 500 contacts long, so it should be plenty, for home use at least! A micro SD card slot allows the same too. You can also share the same on Gigaset’s online cloud, or with other devices. In terms of battery life, it lasted around a week on stand by, and I made a fair few phone calls. The phone can also act as a baby monitor, by the way, not that I used that feature! In terms of internet based features, emails and calendar are quite useful, though I feel like weather has just been thrown in to compete with others. Of course, there is a lot more on offer, and depending on how you set it up, they can be highly useful for you. Of course, it does mean you have bit of a set up to start, but nothing too cumbersome. The SL450A GO is available from Amazon, and retails for £119.99. Previous story Some Christmas gift ideas from Sony!